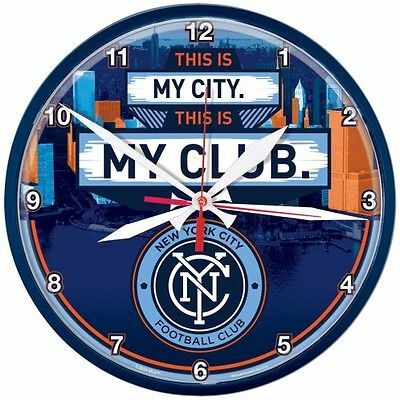 New York City FC MLS WinCraft Sports Blue Round Wall Clock 12" X 12"
Made and designed by WinCraft Sports.Size is a 12″ X 12″.Top Quality Round MLS Wall Clock.Printed on the Front is a New York City FC logo with “This is My City. This is My Club.”The Wall Clock does not come with batteries. High quality quartz movement with a sweep second hand.100% Authentic.Brand new & never used.Tags Included.OFFICIAL LICENSED MLS PRODUCT. Refunds & Exchanges will be issued if the following conditions are met; Tags are still on the item, the item is smoke free, not worn, still in brand new condition, and we are notified within 30 days of receipt. Refunds will be issued once the item is received and the above conditions are met. For exchanges please note the size or item wanted in the exchange. We cannot guarantee that the item requested will be in stock. If the new item is in stock it will be shipped out and if not a refund will be issued. Shipping and handling both ways will only be refunded if the problem is the result of error by Sporting Up. US = $4.99, each additional item for on $1.99. US = $7.99, each additional item for on $2.99. US = $29.99, each additional item for on $3.99. © 2015 Sporting Up Inc. All Rights Reserved. Posts related to New York City FC MLS WinCraft Sports Blue Round Wall Clock 12" X 12"
Sporting KC Kansas City MLS WinCraft Sports Wall Clock Blue 12" X 12"
Sporting KC Kansas City Wincraft 2013 MLS Cup Champs Clear Die-Cut Decal 8"x8"